Fallout 4 has been making waves in the gaming community since its release. People have been singing its praises on many fronts, including the town building, crafting, improved character animation, and voice acting. Another area of accolades is in the leveling system. More than just a new and unique way to streamline one the most fundamental RPG mechanics, Fallout 4's character development system represents an evolution in how Bethesda empowers its players. In order to understand what that means, we must first take a look at its predecessors. Oblivion, being Bethesda’s first open-world RPG with no dice-worlds and fully realized combat, makes a fine starting-point for our purposes. Character progression in Oblivion was unique compared to most other RPGs of the time. When the player creates their character, they select 7 of the game's 21 total skills, which become their major skills. Skills increase as they get used (ex. the Swords skill will go up the more the player uses bladed weapons). After increasing their major skills enough times, the player can level up by sleeping in a bed. Then, they can choose three stats to increase. Stats, like skills, are measured from 1 to 100, and can increase in increments of +1 to +5. The exact increment depends on how many skills that use the statistic were increased since the last level-up. Swords, as an example, are governed by Strength. By increasing the Swords skill, the player is increasing the amount that Strength will be raised if they choose to increase Strength when they level up. Now, if you haven't played Oblivion before reading that explanation, that might sound more like legal-ese than the way characters progress in an RPG. There is a very good reason for that. A common complaint about Oblivion, in hindsight, is that this system was overly-complicated. In order to make a decent character, one had to be extremely careful about what skills they trained and when, lest they only get small stat increases. The fact that enemies scale to the player character's level, and that every stat bonus they receive is always +5, gravely exacerbates this problem. Their equipment also grows stronger, to the point where no-name bandits will accost players for 5 gold while wearing highly protective, expertly-crafted armor worth thousands. On top of that, the enemies dotting the open-world would be replaced by stronger monsters with more powerful skills as the player grew stronger. When starting the game, players are often accosted by wolves and other forest animals. While annoying, these creatures are more of a minor nuisance than anything else. After getting to about level 20 or so, those woodland beasts are exchanged for Minotaurs, which are significantly stronger, faster, and more relentless. Later, even more ruthless Minotaur Lords take their place. As a result, it’s not just that leveling up leaves players with even lower stats than their foes. Those same foes are also being thrown to the wayside so that even more terrifying enemies can litter the field. This problem is so bad that not only are there detailed guides for how to level, but some of them even advocate not leveling up at all as a reasonable solution. After all, unless players are willing to meticulously study and train specific skills in particular orders, leveling up will almost leave them in a worse position. Despite its problems, Oblivion did serve a purpose. It brought skill-based, real-time to the open-world format, doing away with the invisible dice-rolls of its predecessor Morrowind. The radiant-AI that gave all NPCs set schedules also breathed life to the world (if you ignore the absolutely hideous faces and voice-acting). It wasn’t stellar, but it’s a base. Crucially, it is a base that can be modified and built-upon to create something significantly better. Using their now-established open-world format, they were going to bring Fallout to modern audiences with Fallout 3. With a new property comes new progression systems. Though similar to Oblivion, Fallout 3 had a more standard leveling system. Like Bethesda's previous game, characters’ abilities were quantified by a combination of individual stats and skills. However, instead of building up their stats as they developed, players chose them at the start of the game, and mostly stuck with them. As they adventured, their character would gain experience and eventually level up. Of course, that is when the player spent points to increase their skills. More importantly, they selected a perk. Though skills go a long way towards determining what one can do, they are only half of the equation. The perks also go a long way in effectively defining a Fallout 3 character. Each one comes with a powerful benefit, from increased stats or skills to stronger critical hits and even new dialogue options to take advantage of. These passive benefits, combined with skills and stats, give a holistic, yet easy to comprehend, view of a character’s abilities. There were obvious advantages that the Fallout 3 system had over Oblivion's. Firstly, it eliminated the need for meta-gaming that came from Oblivion. Stats were basically determined at the very start of the game, and there was no need to train skills individually since the player can allocate skill points at level up. This meant that players didn't feel pressure to modify their playstyle in order to stay ahead of the enemies. Maximizing a character's performance by researching and planning a build was purely optional, instead of being damn-near required to keep up. More importantly, this simplified the process of character development when compared to Oblivion. Players gain experience, level up, then acquire skill points and a perk before beginning the process all over again. Though one might expect that adding the variables of perks and perk requirements would further complicated the system, the fact the progression is so transparent and plain compared to Oblivion makes it easier to understand what is going on. By glancing at any given character's skills and perks, it is simple to intuit what kind of character they are, and how they are likely to develop in the future. The problem of enemies scaling out of control was also corrected in two ways. First, all characters use the same number of stat points, which are by and large locked in from the very beginning of the game. Furthermore, the number of skill points both players and enemies acquire on level up are based on the Intelligence stat, and nothing else. In this way, the enemies’ skills increase at roughly the same rate as the player’s skills, give or take a few points difference in Intelligence. Given that players are often continually augmenting themselves with new perks and equipment, this gives a total net benefit when leveling up, even if they don’t choose an “optimal” build. The other, less obvious measure Bethesda took when level-scaling is to control how it occurs in the game world. In general, the world scales with the player as one would expect. As the player grows stronger, so too do enemies through the wasteland. This changes slightly when new locations are discovered. By finding a new place to explore, the enemies in and around that area get locked to whatever level the player was at the time. Immediately after leaving the vault, many players, for a number of reasons, don’t follow the road to Megaton and instead head to the nearby Springvale School. As a “dungeon”, for lack of a better term, Springvale is filled with raiders. By finding it this early on, players will lock the enemies there to level 2 or 3. At this point, a large subset of these players will realize their mistake and run away. After completing quests and getting a little stronger, to around level 5 or so, they may desire to go back to Springvale to extract bloody revenge on the raiders that previously humiliated them. Although the world has scaled to level 5 in the meantime, to match the player, Springvale has not. It was previously locked to level 2, where it remains. In Oblivion, players could level up a similar way that the above player could in Fallout 3. However, if they did, and returned to a dungeon this same way, they would likely find that it grew harder due to a combination of the level-scaling and enemies acquiring stronger gear. By locking-in a location’s level when it’s discovered, Fallout 3 makes it possible for a player to realize they are outnumbered and out-gunned, then take steps to get stronger and try again, that they may succeed where they once failed. This system worked so well that Skyrim and Fallout 4 would continue to use it in the future. Bethesda learned their lesson when developing Fallout 3. By building off the foundation of Oblivion, working in some of the design principles of early Fallout games, and mixing in their own observations from the reception of Oblivion, they unknowingly began to embark on a journey of streamlining a simplifying RPG mechanics. Later, when they returned to their iconic Elder Scrolls series with Skyrim, they continued this journey by overhauling the way characters developed in Oblivion. Players still need to use a skill in order to increase it. However, these skills are no longer governed by stats. In fact, stats aside from Health, Mana, and Stamina are gone. Whenever the player improves one of their skills, they gain experience which goes toward leveling up. Advancing a level allows the player to increase Health, Mana, or Stamina and gain a point which can be spent on a perk. Yes. Inspired by their experience developing Fallout 3, Bethesda added perks to Skyrim. Attached to each skill is a perk tree, which lists each perk that falls under that skill, and the prerequisite perks and the minimum skill requirements to take the next rank in each one. Each individual perk costs a single point. Players can purchase any perk that they meet the preconditions for, but may also choose to save up their perk points if there is nothing they wish to acquire. This is important, because it solves a problem that cropped up in Fallout 3. When the player goes up in level in Fallout 3, players are forced to take the skill increases and perk immediately. Occasionally, players in Fallout 3 find that they do not want any of the perks available to them. However, they are still forced to choose one of them to apply to their character. Since skills are trained with repeated use in Skyrim, the odds of this happening are significantly greater. By allowing players to stock up perk points, this problem is deftly avoided. Yet despite how simple the system is, there was a noticeable drawback. Skills that had no perks invested into their skill trees were practically useless, no matter how much they were trained. I very clearly remember a character that I had played in Skyrim that bests demonstrates this point. By utilizing an exploit, I was able to quickly raise each of his skills to 100. However, I had chosen to focus his perks in Stealth, One-Handed, and Illusion above all else. When I tried to use Destruction magic, despite having a skill rating of 100, the effects of those spells were so minimal, and their Mana costs so high, I might as well have been meekly shoving my enemies for all the damage I was doing. This is because I had not invested in Destruction perks which increase damage and decrease Mana costs. Though the skill ratings did have a slight effect, they were absolutely worthless without perks. But that on its own isn’t the problem. When I tried using Destruction-magic with that character, it was really more of an experiment, to see how well my supposed “master-wizard” could actually cast without perks. The problem here is that this system asks, especially later in the game, for players to use skills that they wouldn’t otherwise want to use, in order to acquire points to spend on perks in skills they do want to use. I didn’t raise my characters stats to 100 in order to become a god in a mortal vessel. I did it so that I could get the perk points needed to be a better dagger-wielding, illusionist thief. Without the perks afforded by raising these skills, and thus my character’s level, it’s harder to justify taking perks that aren’t core to my character, but are otherwise useful, like Smithing and Enchanting. Investing in them would eat away at perks I can use on my most useful skills. This might explain the approach taken in Fallout 4. Like Skyrim before it, Fallout 4 attempts to simplify and streamline the leveling process. Rather than go the same direction Skyrim took, Fallout 4 used a different technique more suited to the trappings of the franchise. Instead of removing stats and using skills/perks to determine what a character can do, Fallout 4 opted to remove skills, and use only stats and perks. At the start of the game, the player is given a set total of points that they can apply to their 7 base stats. These stats determine how much health the player has, their maximum carry weight, their ability to make critical hits, etc, as they did in Fallout 3. Experience, as is also the case in the previous Fallout, is earned by exploring the world and doing what comes naturally. And, as Skyrim players would be familiar with, a point is gained on level up. This point can be spent in several ways: The player can choose to take a new perk or advance a rank in one they already have (assuming the meet the requirements) OR increase one of their base stats by a single point. Perks also function somewhat differently to accommodate this new system. Each perk corresponds to a prerequisite rank in one of the base stats, without which one cannot take them. Strong Back, as an example, is a perk which raises the player's maximum carry weight. It is the Rank 5 Strength perk, and cannot be taken unless the character in question already has 5 points in Strength. Every perk also has multiple ranks, which provide even bigger bonuses, and these are gated off by the current level of the player character. Rank 2 of Strong Back, to continue our example, increases the benefit of Rank 1 and can only to taken once the player is level 10 or higher. Even more than in Skyrim, this means that any given player's build is closely tied to what perks they have. By looking at what perks one has taken, it is easy to tell what kind of playstyle they have and/or are going for. The character I played has 5 Ranks each in Rifleman and Sneak, along with 3 Ranks in Sniper, Better Criticals, and Grim Reaper's Sprint and 2 Ranks in Action Boy and Ninja. Someone who has never played Fallout 4 has no idea what any of this means. To one who has played Fallout 4, and even to some who have only placed Fallout 3 or New Vegas, this tells them that I like to abuse VATS to get tons of Sneak Attacks and Critical Hits from a distance using scoped, non-automatic rifles. It also gives a rough idea of what stats I'd need to have in order to acquire all of these perks, since each one has a minimum requirement. It also solves the problem that Skyrim had where skills and perks weren’t always in alignment. Since skills don’t exist, the “master-wizard” problem I outlined earlier from Skyrim is no longer an issue. As a result, the player character’s abilities are more accurately reflected by their stats and perk ratings than their skills in Skyrim. Perks are also dependent on having a minimum stat rating before they can be taken, increasing the likelihood that stats will correlate with the perks acquired. This all results in a cohesiveness of character absent from the higher-level Skyrim characters. But despite that, there is still some noticeable room for improvement. Even if the concept behind the perk trees is extremely simple, Bethesda didn't give much in the way of tutorial for how to use it. If one didn't follow the pre-release materials that explained how these systems worked, as I had, they could easily be forgiven for not understanding the system. By looking at the in-game perk chart, it is easy to see why so many assume that they need to get a given stat's perks in order, from top to bottom. The chart makes it seem like such linear progression is necessary. Because of this, it's possible to put points in perks one does not want or need not knowing that they can easily bypass them to get the perks they want if they have high enough stats. The combination of the graphic designer and the lack of tutorials conspire against the player. The another primary issue is that leveling-up doesn’t feel as meaningful as it did in previous Bethesda games. The only thing players gain at level-up is the perk point, and a few extra hit points. To compensate for this small reward, level-ups are much more frequent than in previous games. In Fallout 3 and Skyrim, leveling up felt like a special event. After enduring many tough trials, Fallout 3 characters were rewarded with the chance to strengthen their skills and obtain a unique bonus for themselves. And although Skryim also gave only a perk point and some bonus health/mana/stamina on level-up, the skill training required to grow stronger was a reward itself. Not only were the rewards more substantial, but they came infrequently that the player could eagerly look forward to the next time they built up enough experience to see that screen just one more time. Perks, and thus levels, have to arrive at increasingly frequency in Fallout 4, depriving players of their dopamine fix. 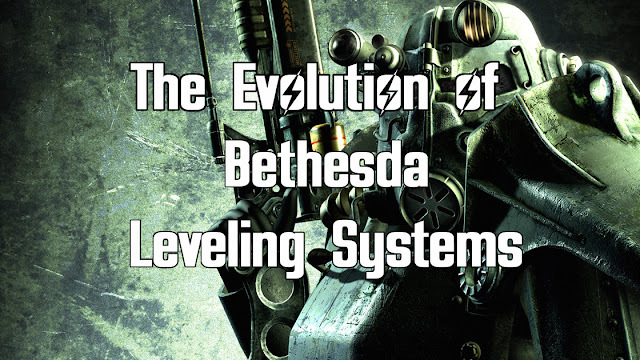 Fallout 4's level system isn't perfect, but it is another step in a long journey that Bethesda started in 2006 with Oblivion. For better or worse, Bethesda has been focusing on refining and streamlining the mechanics in their games, the leveling system being only one prominent example. Even if there are some flaws, one must appreciate the desire to experiment and improve these systems. Once people have had enough time to properly digest Fallout 4, I have no doubt that we will discover flaws that have been otherwise overlooked at the time of writing. It will be interesting to see what Bethesda does in response to these criticisms, and which direction they’ll along this road to refining their mechanics.